Another day, another story of conflict between a cyclist and a driver, I guess? Today's tale in this city battling over regulations for bike riders involves a Cadillac, an allegedly sideswiped cyclist, and a witness who's very swift with their camera. Cyclist Maxwell Wallace told both the SF Examiner and KPIX that he was in the bikeway at Fulton and Divisadero Monday at around 11 a.m. when he came upon some lane-blocking construction. He then "circumvented it briefly by sharing the side of the road" and "a vehicle came up on his side and side-swiped him," the Ex reports. “I yell, ‘Stop!’ I was pretty shocked that he didn’t stop,” Wallace told KPIX. So, he got in front of the still-moving vehicle and attempted to take a photo of the car's license plate, he says. “He sees me there trying to take a photo, and he guns it, accelerates, and I jump up quickly,” Wallace told the Ex. “Didn’t imagine that when you go after somebody hits you, to talk to them, get their information that they would try to run you over,” Wallace told KPIX, saying that by jumping on the Cadillac's hood “I’m alive. But if I hadn’t, don’t know where I’d be." Wallace clung to the Caddy's hood for about 100 feet, as a witness captured the photo you see above. 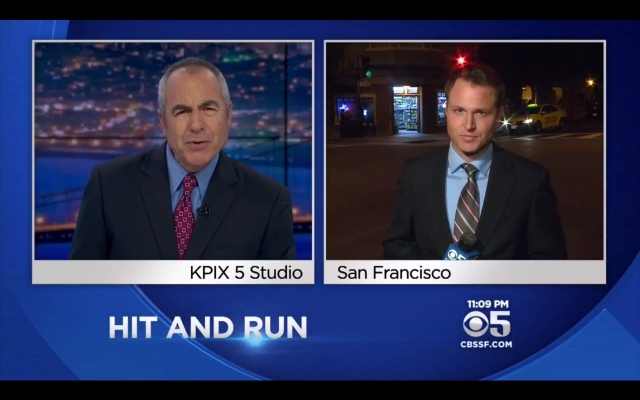 But it's that photo that caught KPIX anchor Ken Bastida's critical eye. The photo "looks strange," Bastida said at the conclusion of his station's report, with a skeptical moue. "There's a perfect photo of the guy on the hood of the car, and in the original, you can see the license. Who took that picture?" Of course, the reason police don't have the other side of the story is that the driver allegedly sped off (after briefly stopping to let Wallace hop off the car), which Manfredi acknowledges is grounds for a hit-and-run charge, as well as for charges that the driver did not follow California's requirement that drivers give cyclists a three-foot buffer. Manfredi tells the Ex that "the case is now in the hands of hit and run investigators." As those investigators have the photo that includes the driver's license plate, I'm sure this will be cleared up in no time.